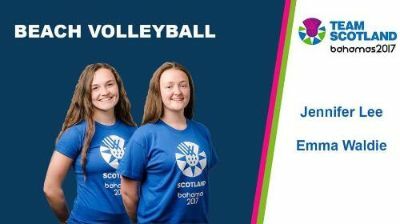 City of Edinburgh VC players Jenny Lee and Emma Waldie, who represented Team Scotland at the 2017 Commonwealth Youth Games, narrowly missing out on the Bronze medal. The girls racked up victories against Vanuatu, Jamaica and The Bahamas on their way to the semi-finals, where they lost to New Zealand. 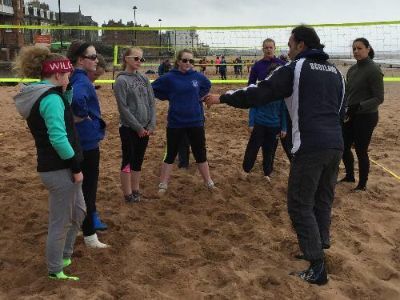 CoE U18 and Women's II players Emma Waldie and Jenny Lee (in the red tops) who recently competed in the CEV SCD Beach competition in Perth. The weather was superb and it was a great learning experience for them. Here they are with CoE Women's players and experienced beach pairing Jen Thom and Jo Morgan. 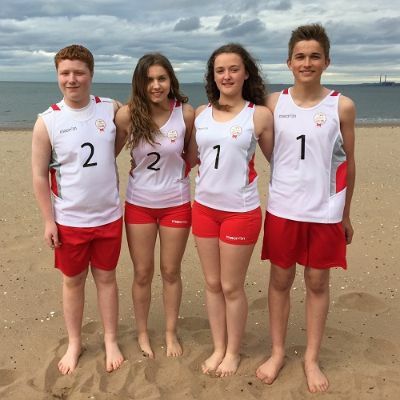 Logan Darling, Amy Rankin, Emma Waldie and Harris Ritchie who represented Edinburgh at beach volleyball at the 2015 International Children's Games in Alkmaar, Holland, on 24-29 June 2015.